We are passionate about supporting small UK businesses and we carefully handpick our stock with our customers in mind. We have lovely gifts perfect for Mother’s Day including gorgeous candles, toiletries, jewellery, home ware, dinnerware, scarves and much more. 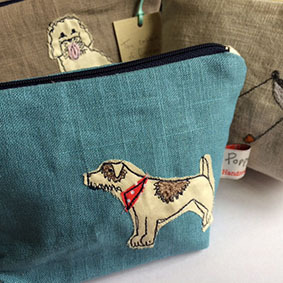 NEW IN, Poppy Treffrey purses and makeup bags. These charming pieces are handmade in Cornwall and make the most lovely gifts. Our range of Emma’s Soap is another gift shop favourite, Emma’s soap are handmade and wrapped on Organic fair trade cotton. When you are next in for a cup of tea, head through to the quiet room and take a peak at our gift shop.